I’ve mentioned before, both in a written post and our most recent podcast, that one of my favorite aspects of verse novels is their use of space. While traditional prose appeals to the senses with its use of description and beautiful words, verse fully engages the senses with its placement of lines, words and letters amongst the space of the page. And no author I have read excels more at utilizing the white of the page to its full effect than Lisa Schroeder. 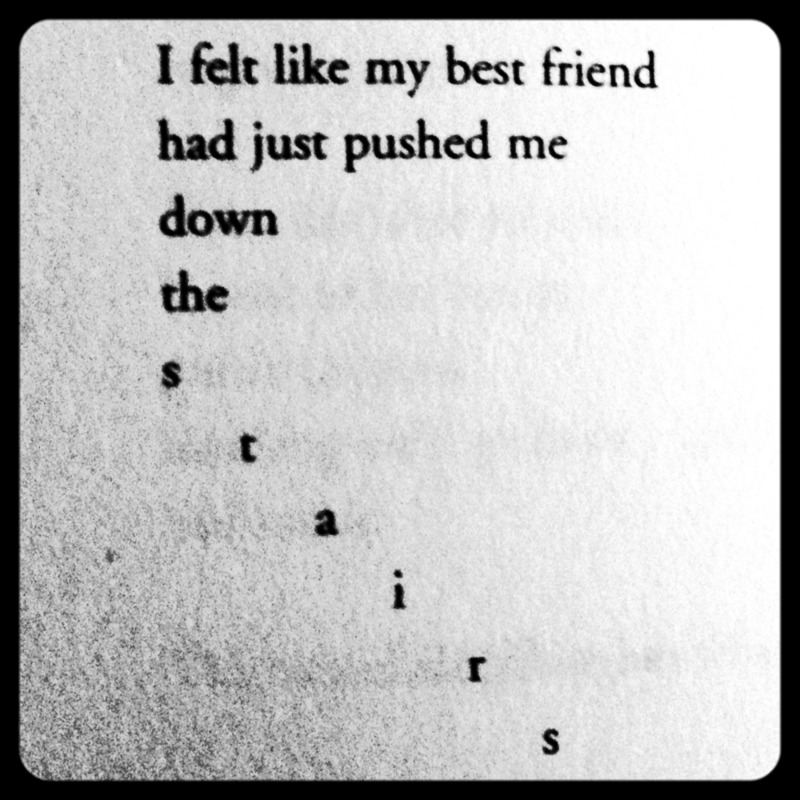 For example, in Far From You, when Alice is crestfallen by a criticism of her songwriting, the letters fall down the page in a staircase pattern, making me feel like I am falling with Alice as she reels from the harsh emotional sting. When I open a Lisa Schroeder book, I feel like I am reading a piece of music and viewing the composer’s markings for tempo, rhythm and dynamics, along with the patterns of notes with thick chords, frantic scales, or languid rests. I have a strong sense of what she is trying to convey before I even read the words because simply glancing at the page and witnessing how the words are grouped together, how they are spaced apart, and how they move up and down, tells me so much. So when it comes to Lisa’s use and placement of words, I don’t just identify with the loneliness of the character when they describe how no one understands them. I feel alone when the word is spaced by itself on a lonely patch of white. I don’t just picture a crowd of teenagers dancing to a bumping bass beat at a party. I feel the beat and physically move with the words as they bounce amongst the space of the page. Similarly, I love (and am supremely jealous of) Lisa Schroeder’s ability to fully express and develop stories and characters with an exquisite sparseness of words. In verse, as in music (y’all are going to have to bear with me on the music metaphors here), nothing is wasted. A note in music is not just a frequency, but a specifically placed point that is integral to the composer’s story. In the same vein, each word in a Lisa Schroeder novel is not just a word and its dictionary definition, but also a punctuation of emotion, a feverish intensity, a low rumble of frustration, all of which provide telling glimpses into the essence of her characters. With the seconds it takes to read the four lines Radio for Help from The Day Before, we fully understand that there is a kinship between the characters Amber and Cade, though they have just met, that corresponds to their attempts to escape from the uncertain tumult that is to besiege them the next day. AND Lisa Schroeder uses a metaphor that perfectly aligns with their day on the Oregon Coast. Do you know of another author that can express all that in 4 little lines? On a personal level, I love that Lisa Schroeder is on Team Introvert, which is fully apparent in her characters who value solitude, and have interests that reflect such. Rae in Falling for You writes poetry. Her friend Leo is into videography. Alice in Far From You is a songwriter and guitar player. The list goes on and on. There are times when I feel suffocated by a world that seems to only value the opinions of the outgoing, the brash, and the “popular”. So it is especially refreshing to see an author who writes and --this is very reassuring and important--normalizes teenage characters who are quietly thoughtful and creative, as those are the people in real life who are often ostracized or made to feel abnormal growing up by the adults and peers in their lives. I cannot express how appreciative I am of this even as an adult, and can only imagine how awesome it must be for introverted teenagers to see themselves reflected in Lisa Schroeder’s characters. Beyond all that, I love that Lisa Schroeder’s writing embodies what I look for, not just in a verse novel, but in any novel. For one, she fully utilizes setting to the point that the settings are characters in and of themselves. For instance, in I Heart You, You Haunt Me, a waterfall known as Heaven’s Hideaway plays a central role, to the point where it is far more than a “place where things happen.” While reading, I found myself digging out my scrapbook from my reckless New Adult days, when my friends and I regularly went hiking through the gorges of Ithaca, NY and cliff-jumped into the waters below during the summer. Similar to Heaven’s Hideaway, the waterfalls of Ithaca, NY symbolized everything that I loved, feared and tested about life at the time, with their majestic beauty, their irresistible allure, their tempting height, their fathomless depths, and the dangerously deceptive transparency of the waters below. They were, and are, fundamental places that played a part in shaping who I have become, akin to how Heaven’s Hideaway is essential to the main character Ava’s journey as she moves through a tragic loss. Furthermore--as she does in person--Lisa Schroeder embraces a positivity for life throughout her books, from the characters to their relationships to the overall narrative. As I’ve mentioned before, a big part of why I am drawn to YA as opposed to Very Serious Literature is because YA tends to embrace the school of thought that life, despite its hardships, is worth celebrating, and enjoying. Moreover, Lisa Schroeder is able to express this attitude in a way that is not cloying, or manipulative, or without respect to adversity. The titular character of Chasing Brooklyn is struggling to overcome the devastation of the deaths of two people close to her. Cade in The Day Before is understandably terrified about what lies ahead for himself, and a close family member. Amazingly, Lisa is able to recognize the challenge and frustration of accepting change, which is of course inevitable in life, while still honoring the past, AND authentically developing strength and comfort in her characters for the future. They make mistakes, as we all do, but they also find love in unexpected places. They discover that they’re not as alone as they originally thought. They build circles of support for themselves when their own families fail them. And they surround themselves with other people who are willing to do the same, to foster healthy relationships and positivity, which exemplifies how I like to live my own life. Finally, I love that Lisa Schroeder’s books remind me that no matter what happens, there is always more room for hope and love in my life. Like Eric and Tami Taylor in their marriage, Lisa Schroeder understands and teaches us that embracing change doesn’t mean regretting the past, that losing one thing does not mean we’ve lost everything, that letting go doesn’t mean forgetting, and that delighting in something new does not mean discarding the old because we can always use some more love. Make some room in your life to love Lisa Schroeder.